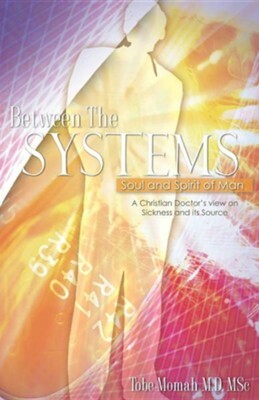 Tobe Momah in this seminal work shows how the Spirit, Soul and Systems of man intertwine to cause disease in our present day medical community. He proposes that many sicknesses in todays medical community are non-physical in origin and will respond to alternate therapies like prayer, psychology, provision, purity, positive attitude and adequate nutrition without recourse to medications. "Tobe Momah has written from the perspective of a Spirit-filled medical doctor and I believe that the insights contained here will grant every reader positive results in both physical and spiritual health." Dr. Pastor Paul Enenche Abuja Nigeria "In this book Tobe Momah has dissected the didactics of Modern medicine by using the human body as the temple of God." Gregory Perrier MD Orthopedic Surgeon "Tobe Momah weaves a compelling Bible based foundation for this unique perspective on sickness through the eyes of a Christian doctor." Stephen Carryl MD Bariatric Surgeon TOBE MOMAH is a medical doctor with medical degrees from the University of Nigeria and the London School of Hygiene and Tropical Medicine England. He is currently a family medicine resident in New York City, from where he coordinates the activities of his ministry - Faith and Power ministries - which includes publishing, missions and through its humanitarian arm - Saints Specialist Services - free health care and feeding programs to the most needy. His vision is to show Gods power to this generation and to the ends of the earth; in pursuit of this vision he has worked as a medical missionary in Ethiopia and served as a two-time vice-president of the Christian Union campus fellowship. He is the author of A General and a gentleman and Buildinglasting relationships - a manual for the complete home. He is married to his lovely wife Rita and they live in Brooklyn New York. I'm the author/artist and I want to review Between the Systems, Soul and Spirit of Man.